For those who want to explore a little further I have added here three papers written for a special issue of On the Horizon, edited by Dennis Morgan, that took up a number of themes from the book and explored them further. These works represent a new stage in the process of peer review and evaluation of the thesis of the book and should be taken seriously by scholars in this and related fields. They raise a variety of issues and are prefaced by my intro piece. 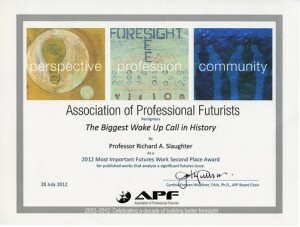 The Association of Professional Futurists (APF) marked its 10th anniversary with a series of events in Toronto during late July 2012, most of which I attended. Among them was an evening get together in the Distillery District during which time a number of awards were presented. 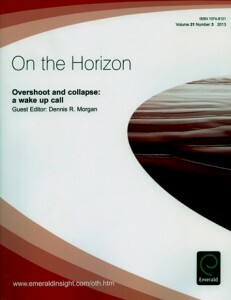 One of these was a Most Important Futures Work (MIFW) for my 2010 book, The Biggest Wake-Up Call in History. In the book I reviewed the global predicament, some of the strategies proposed to address it and possible ways forward in what look like increasingly impossible times. The relevant award category was ‘published works that analyse a significant futures issue.’ The other publication thus honoured was Tim Jackson’s stimulating Prosperity Without Growth. It is indeed an honour to be recognised by the APF and to share the limelight, as it were, with such a ground-breaking work. I am grateful to all those who were involved in this year’s selection process. The following are some of the comments received about part one of the manuscript. I’ve just finished reading through your manuscript and wanted to share some thoughts. As always, you write with wonderful clarity and scholarship, which makes reading the work a pleasure in spite of the gloomy subject matter (in Part One). I certainly think the argument stands up to scrutiny and is one that needs to get more attention. I particularly enjoyed your exploration of the shadow in the social domain – I’d like to see more of this. Dr Chris Riedy, Institute for Sustainable Futures, University of Technology, Sydney. I’ve read chapters 8 and 9 today and am really impressed with the flow and coherence of your argument. It is also inspirational in many ways, opening up areas of hope that many of us have gradually lost as the years and opportunities have slipped by! The analysis of the fourteen well-chosen books was quite an eye-opener, – I will be tempted to buy Greer and one or two more when I’ve time! Thanks for the privilege of reading such an interesting and beautifully woven text. Just a brief response but what I’ve seen in the first read through is very strong and will be a valuable contribution. I’m already thinking of this as a textbook in a ‘new’ unit in the Masters… You should be proud of this. It is some of your best work. Chapter 10 makes it seem possible (but a challenge). Chapter 11 will certainly push some buttons but needs to be said – if we need development then maybe I should be developing – the examples at the end of Chapter 11 are great. A very strong and forthright conclusion. Dr. Peter Hayward, Convenor, Foresight Program, Faculty of Business and Enterprise, Swinburne University, Melbourne. I really like the story and the argument that you’ve presented in Part Two – and you’ve made the case extremely well. I have just finished skimming your chapters. WOW! It just fascinates me to see how aligned we are in our thinking. Your work really pushes the edge and is a most pertinent addition to the literature at a time when it is so badly needed. I have no concrete suggestions that would improve what you already have. Your writing is meticulous. I really enjoyed this section – you come across as positive but not starry-eyed, passionate, but not crazy. You have mapped out a positive direction of individual and cultural transformation, in the context of a “high tech” external reality – which is much more likely to grab people’s attention, than the “monastic,” low tech approach of the last couple of thousand years. (Overall) I think your book makes a major and needed contribution to the debate, and further opens the Integral method to an area where it is much needed. Adolph Hanich, Family therapist and former Director of the Australian Graduate School of Entrepreneurship, Swinburne University, Melbourne. The Biggest Wake Up Call in History is a must read for anyone who cares about the future their children and grandchildren will inherit. Powerful and hard hitting as it must be for a wake-up call, yet visionary as it must be to inspire. John Renesch, Businessman-turned–Futurist, author, Getting to the Better Future. 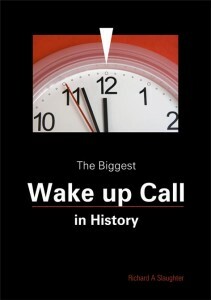 Just a quick note to say congratulations re: The Biggest Wake Up Call in History. The cover is terrific and so is the Introduction.